Gorecci Street Map of location in Port Maje Region in Pillars of Eternity II: Deadfire Video Game. 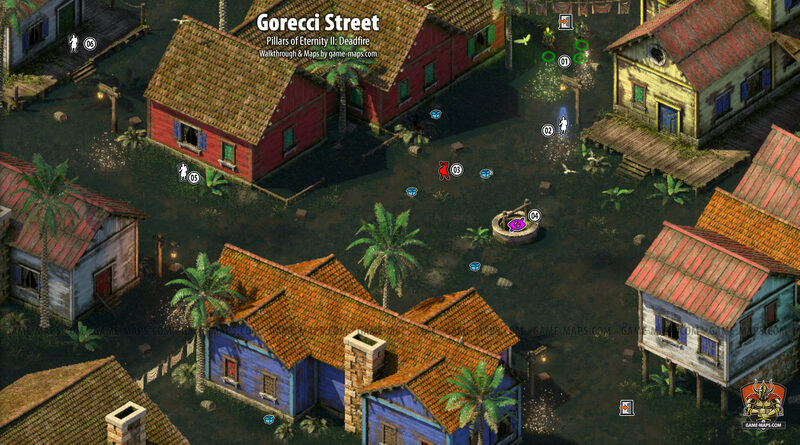 Gorecci Street Map for Pillars of Eternity II: Deadfire. As you make your way along through the side streets of Port Maje, you come upon visible traces of the storm's passing. Many of the houses here boast cracked window panes and sagging awnings, and you pass narrow streets strewn with foliage and debris. The cobblestones beneath your feet are still slick with water and silt. Before long you are ankle-deep in sucking mud and loose stones. The flooding only worsens up ahead, where the water level rises to the knees. Most of Port Maje's residents have fled this region for dry land. But the murmur of raised voices ahead, and the occasional splash, suggest that you are not entirely alone. I convinced Ilari to take charge of Gorecci Street and prevent any more looting.